The leader of the Indigenous People of Biafra and founder of Radio Biafra, Nnamdi Kanu, been produced in court for his arraignment on treason charges and other offences bordering on his agitation for the secession of the Republic of Biafra from Nigeria. ‎He is being arraigned along with two others – Benjamin Madubugwu and David Nwawuisi – before Justice James Tsoho. 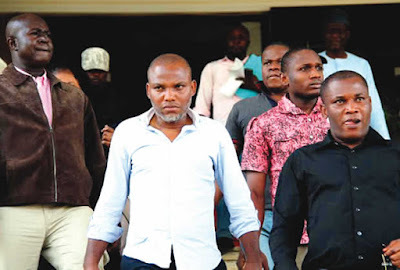 ‎Earlier on December 23, 2015, when Kanu and the two co-accused were produced in court for arraignment, the IPOB leader refused to take his plea due to what he called his lack of confidence in the presiding judge, Justice Ahmed Mohammed. Justice Mohammed had then returned the case file to the Chief Judge of the Federal High Court who thereafter re-assigned the case t‎o Justice Tsoho. ‎Kanu has been in the custody of the Department of State Service since October 14, 2015, the day he was arrested in a Lagos hotel, on the allegation that he was plotting the secession of Republic of Biafra from Nigeria. The three were, in counts four and five, accused of assisting in the management of unlawful society and unlawful possession of firearms.